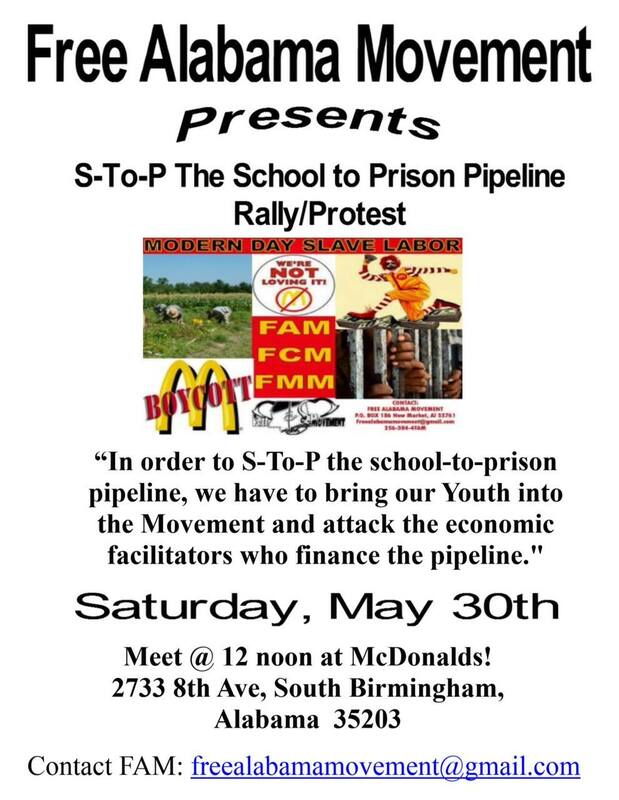 FREE ALABAMA MOVEMENT kicks off Sept. 9, 2016 National Non-Violent and Peaceful Prison Shutdown for Civil and Human Rights at Holman prison in Atmore, AL. 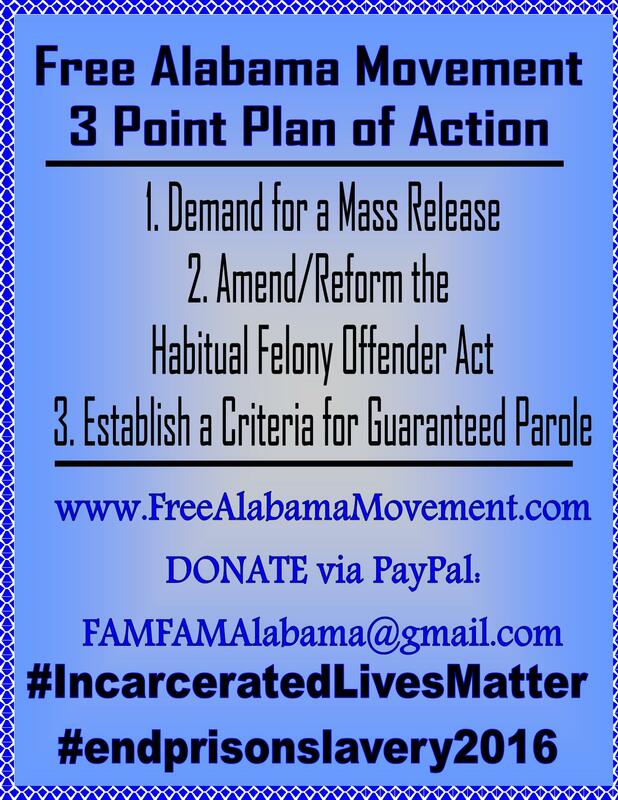 After launching its Movement in 2014 with the first coordinated work stoppages and shutdowns in Alabama prison history, FREE ALABAMA MOVEMENT, building on its success with subsequent strikes, issued a call in 2015 with its document titled F.A.M.’s 6-Step Plan of Action 2015 (see our WordPress blog) for the first coordinated Nationwide Prison Work Strike in US History. This plan, along with its publication, “Let The Crops Rot In The Field” were then circulated throughout F.A.M.’s nascent network of supporters for its National Freedom Movement Against Mass Incarceration and Prison Slavery. With assistance from other organizations and people, including Bro. Lorenzo “Kim’Boa” and Sis. JoNina Irvin of the Ida B. Wells Coalition against Police Brutality, Brianna Peril and David Boehnke of IWW/IWOC, Annabelle Parker, Mary Ratcliff of San Francisco Bay View, FREE MISSISSIPPI MOVEMENT and FREE MISSISSIPPI MOVEMENT UNITED, Queen T of SignofTheTimes/ FREE OHIO MOVEMENT, Anthony Robinson/The New Underground Railroad, Mississippi Southern Belles, Anarchist Black Cross and many others, F.A.M. began organizing, leading and directing this National call. 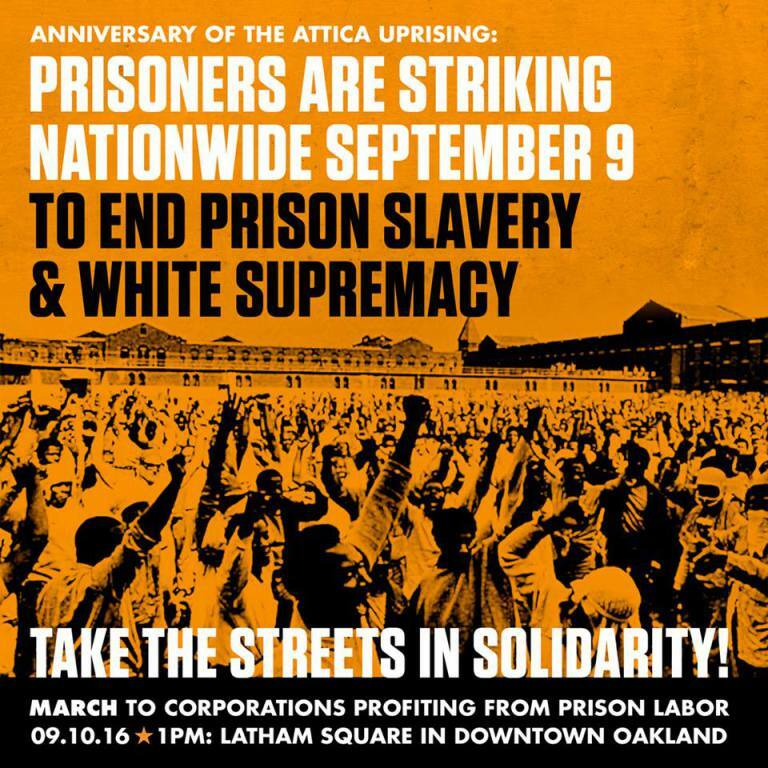 Today, September 9, 2016, at appx 12:01 am, FREE ALABAMA MOVEMENT has kicked off the Sept. 9, Nationwide Prison Workstrikes, Boycotts and International Protests from Holman prison in Atmore, Alabama, in solidarity with confirmed strikes underway in Florida, South Carolina, and Texas. F.A.M. 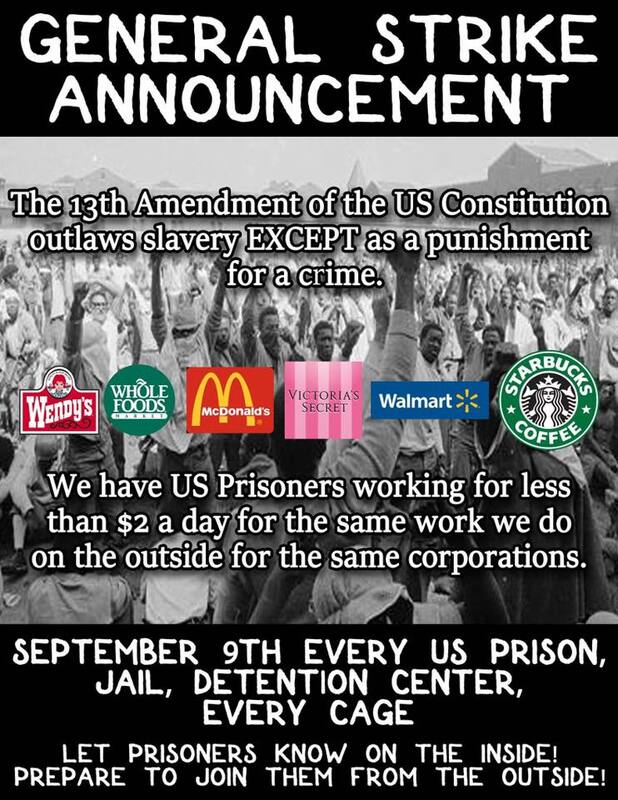 has reiterated its call, first made January 1, 2014 with its first coordinated Workstrikes, for Non-Violence and Peaceful demonstrations both inside and outside of prisons as the solution to the exploitation and other forms of abuse that take place in Americas prisons, including forced prison slavery. F.A.M. 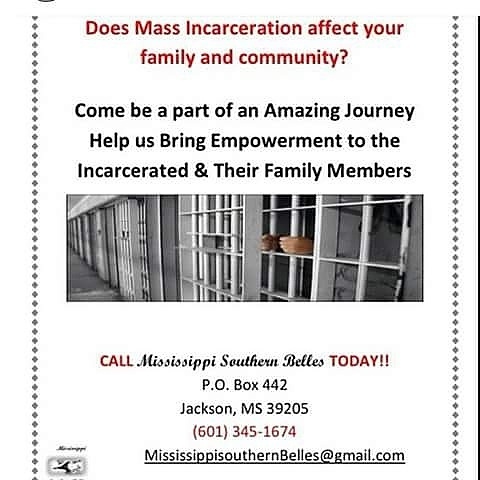 has often stated that the solution to mass incarceration and prison slavery must be lead by the men, women and children who are incarcerated and who are contributing to prison slavery and our own oppression by continuing to produce goods and provide services and purchase products that generate billions of dollars in revenue each year to support prison slavery. The 13th Amendment to the U.S. Constitution continues to permit slavery to exist in this country “as Punishment of crime, whereof the person has been duly convicted,” and the institution and enterprise of slavery was legally transferred to the State government’s prison systems. These Non-Violent and Peaceful protests are designed to expose the nefarious economic motives of individuals, State and Federal government, and corporations like McDonald’s, Wendy’s, Starbucks, John Deer, the ALEC corporation, Victoria Secret, US military, Whole Foods, Wal Mart, Keefe, AT&T and Verizon call centers, and many others behind laws like mandatory minimums, three strikes laws, juvenile prosecution as adults, etc. that are used to incarcerate people under oppressive, inhumane conditions for extended periods of time, solely for the use of free prison labor for profit — yet in the name of crime and punishment. F.A.M. 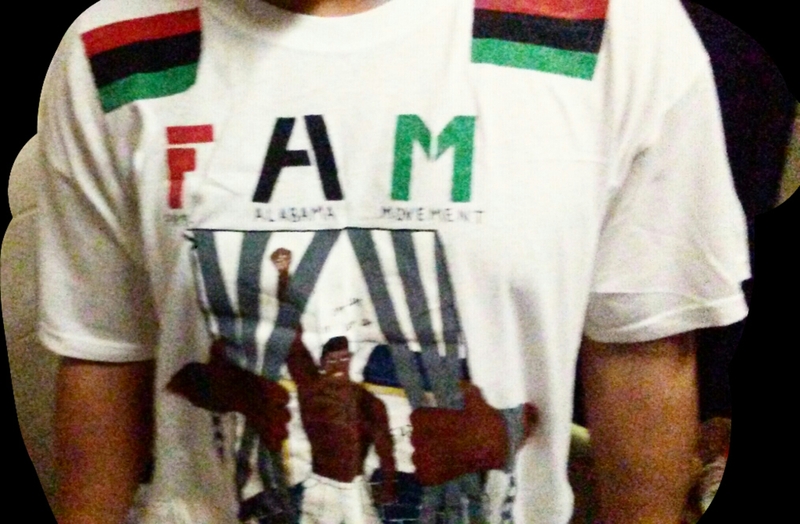 has issued a “FREEDOM BILL“, which contains the demands that they are imposing upon the Alabama legislature to correct the problem of mass incarceration and prison slavery in Alabama. 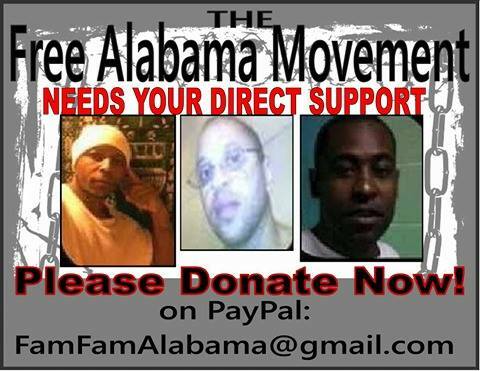 To assist FAM and their National Freedom Movement and to support the people on the inside who are making these sacrifices, please donate to famfamalabama@Gmail.com today.